Homepage. 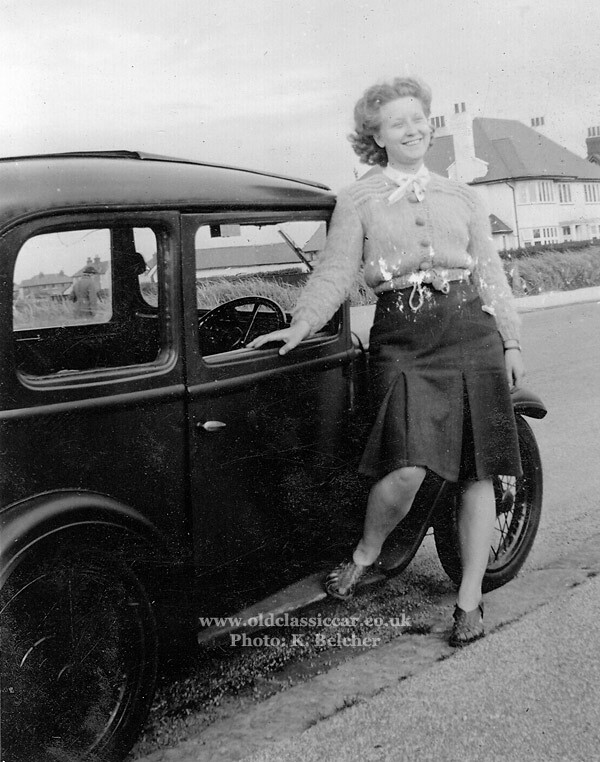 This page: A second page of original black and white photos of vintage and post-vintage Austin 7hp box saloons. 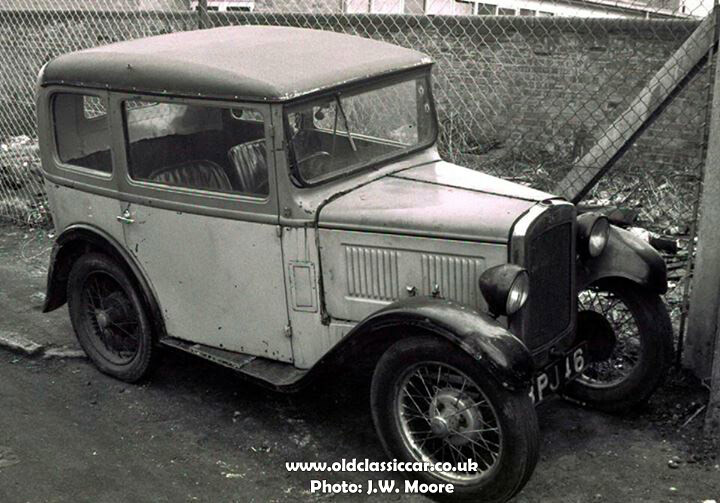 The popularity of vintage and post-vintage Austin 7s continues, and this new page follows on from Page 1 in this site's collection of original Austin 7 car photographs. As further suitable photographs turn up, I'll add them in here. If anyone can help out with more ancient photographs of cars like these, please drop me a line as I'd be interested to see them. 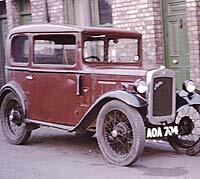 Austin 7 RL, with two-door box saloon bodywork, registration AZ 6318 first saw use in the Belfast area. It's shown here with a vintage motorcycle (reg. XI 2717) for company, parked on an unidentified beach. 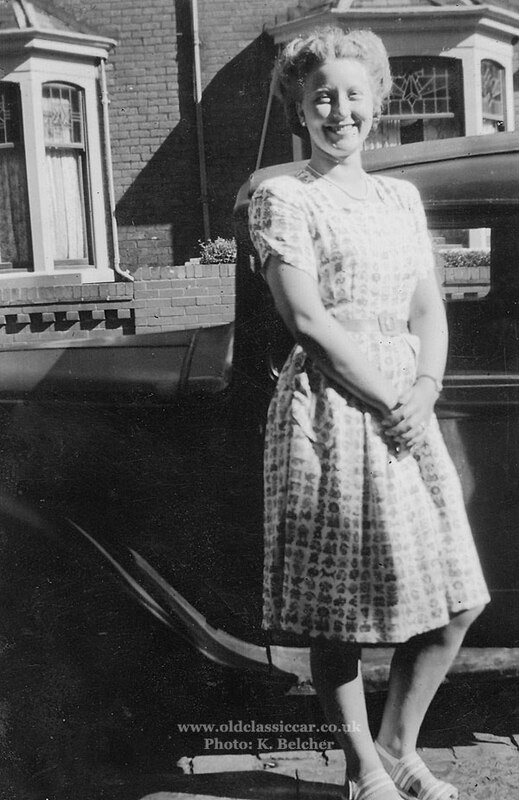 Can anyone help with the identification of the Austin's two-wheeled companion? As was typical on pre-war vehicles such as this, the registration number has been painted on, rather than being displayed on a pressed or cast aluminium plate. The RL version of the popular 7hp light car went on sale in the summer of 1930. While still powered by the 747cc sidevalve four-cylinder engine, the RL introduced the use of pressed steel bodywork to the range. Compared to the previous R, the RL is most easily identified by its longer bonnet, coupled with a shorter scuttle. Under the skin, the four-wheel brakes were now coupled. Sales of the saloons continued to be strong, so much so that 1930 would see the saloon outselling the open cars for the first time in the model's history. Having a two-tone paintjob, the following Austin 7 may well have started out in life as a Deluxe model. If so, when new it would have had a sliding sunroof. 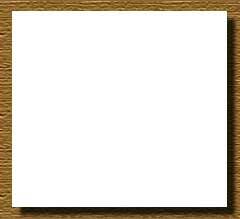 This example was John W.M. 's second car, registration BPJ 46. The BPJ series came along in August 1934 according to my records, it was in this month that the chrome-radiator RP box saloon was replaced by the Ruby. 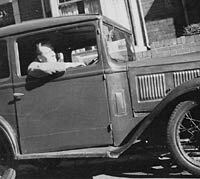 John remembers his car being a 1930 model, and it certainly looks earlier - by several years - than its mid-1934 registration number. By the time of this photo, the baby Austin was showing its age. Pre-war cars were still quite commonplace in the late 1950s and early 1960s, and provided much enjoyment to newly-qualified motorists keen to explore their locality from the relative comfort of their own four wheeled motor. Prices were low, and "parts donor" cars in scrapyards were plentiful, which made running a car on a modest income feasible for many. This one is missing its radiator cap. 3. Let's go for a spin in our Austin. 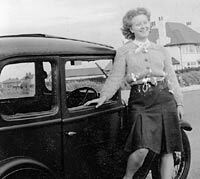 Neither the identity of the lady shown here, or of the car itself (an Austin 7 clearly), let alone the location, is known sadly. This snapshot, like so many, will forever remain a photograph of unknowns. What was the reason for taking the photograph? Was it taken prior to another day trip out to the countryside? 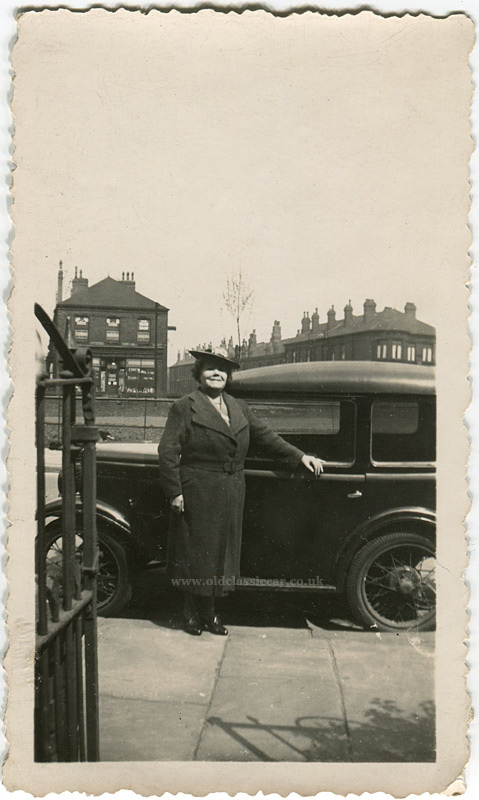 Had the lady just purchased the Austin, perhaps with her husband who took the photograph? Maybe she'd just sold it, and was standing for a final pose with the baby Austin before it went to a new home? Or was she preparing for a driving lesson? We'll never know. In the background is a shop, the sign for which reads "???? CO-OPERATIVE SOCIETY LTD". Had the wrought iron gate not been present in the photo, then its full title may well have been discernible, thus shedding light on the likely location for the scene. Ah well. 4. A box saloon at rest. Mike posted this on Facebook, and agreed to it being included here too (thanks). 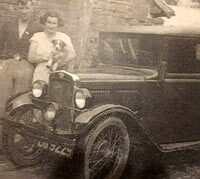 In this photograph, his Auntie and Uncle (plus dog) stand alongside a box saloon. The illumination on this example has seen a couple of useful upgrades - semaphore turn signals have been added to either side of the scuttle, while at the front a sizeable single spotlamp has been mounted centrally between the headlamps. The registration is partially obscured by the front bumper, which in itself looks like a non-factory fitting. The registration could well be OG 9229. This Birmingham series ran for one year only, from April 1930. 5. 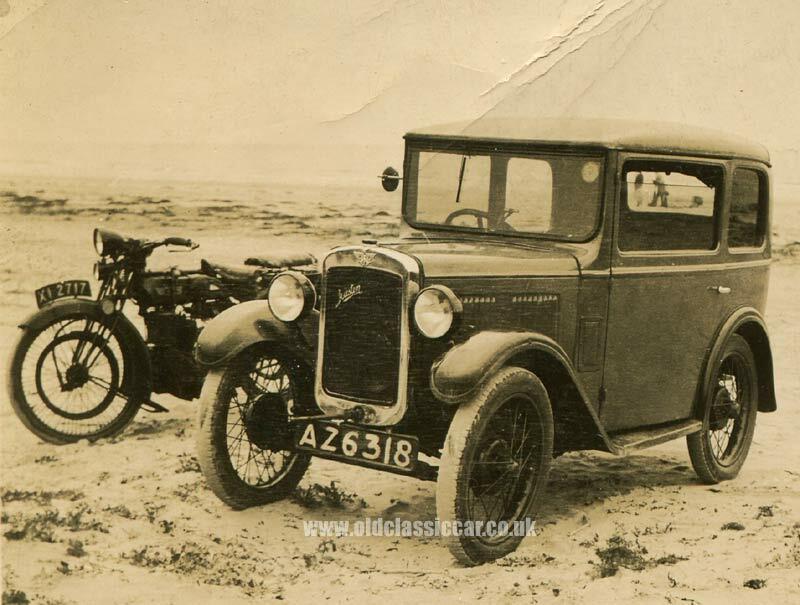 An Austin 7 purchased shortly after WW2. With the war out of the way, many motorists were keen to dust off their driving gloves and return to some sense of normality. "Normal" life would take a long time to come for most people, and anyone with aspirations of taking to the tarmac once more would either have to dust down their pre-war car after several years out of use, or else look around the used-car lots to find a pre-war car to fill in, until such time as new cars were more easily found. 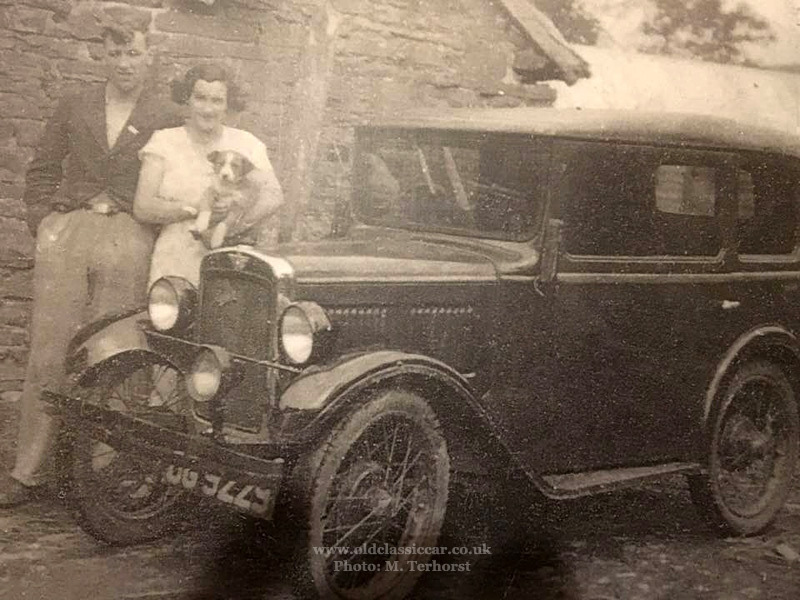 Keith has provided a broad selection of car-related photos to share on Old Classic Car, and here we have four photographs of the Austin 7 box saloon that his mother and father bought, in 1948. 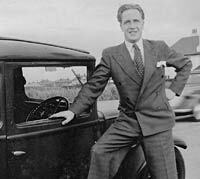 The first two photos show his father, and then his mother, stood alongside the driver's door of their pint-sized Austin. While fuel was rationed quite severely at the time, any opportunity to take to the road and enjoy the odd day out, after the misery and constant stress and upheaval of WW2, would have been grabbed eagerly with both hands. 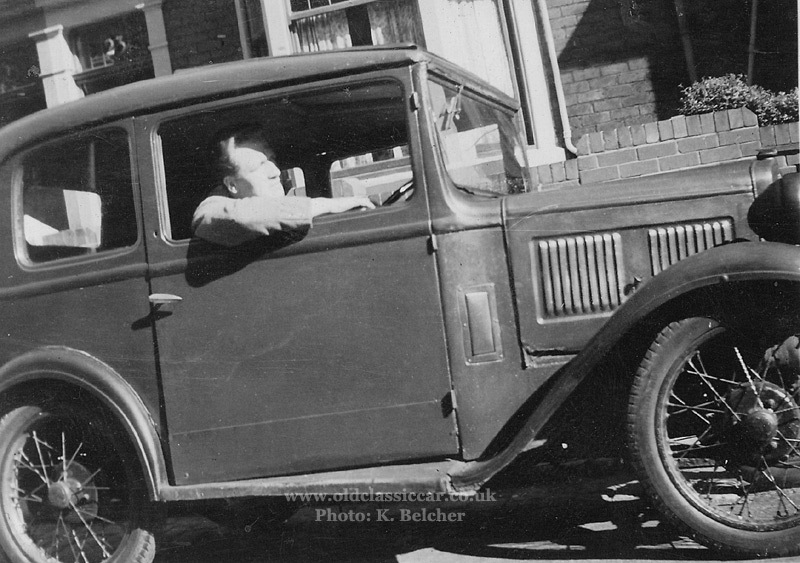 In photo three, Keith's father is shown behind the wheel of his Austin. Note the repair effected to the lower few inches of the door skin. 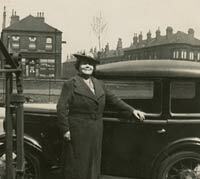 Keith's mother features in the last of these four photos, stood beaming alongside the 7hp Austin. "These are of my dad's Austin 7 he bought in 1948. The receipt says he paid 61 pounds for it. Reg OJ 7630. 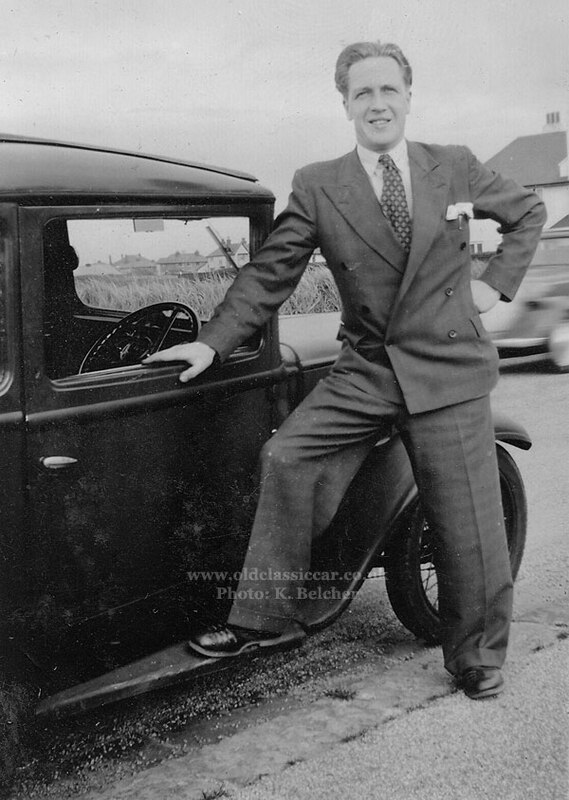 When I was but a young lad in the early 1950's, my parents would regale me of tales and adventures in their jalopy. They said it was falling to bits when he bought it. Cars were in very short supply in those days. Compare it with the 1939 car receipt you have on your site for 1939 at 27 pounds!" "Dad used to tell me of his RAF days. The squadron owned several 7s. When they went into town, they used to chalk the names of the passengers on the bonnet. When you got back to the car you would rub your name off. The last man to return would drive back, drunk or not." "OJ served mom and dad for a few years. They used to tell amusing stories of their adventures in it. The passenger seat was held in with pieces of wire. The seat would turn with mom in it when they went around a corner. Mom would beg dad to go around an opposite corner for her to turn back facing the front. One day, the handbrake lever came off in his hand. He threw it out of the window saying "I never used it anyway!". They used to go out usually with friends. When they got to a hill, the passengers would have to get out and help push it up. Going down was a breeze but a worry as you could run into something because the brakes were so bad. Dad used to park it on a piece of waste ground opposite their house, in the Birmingham slums. People would remark to him that another piece had dropped off yesterday. The day he part-exchanged it in 1950-odd, the chassis snapped and he stood in front of it so the salesman wouldn't notice. He got away with it, and drove out with a Vanguard. 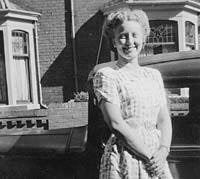 The picture (above) are in late 1948 in Torquay." Very interesting Keith, thanks for the photos and just as important, the stories behind them! 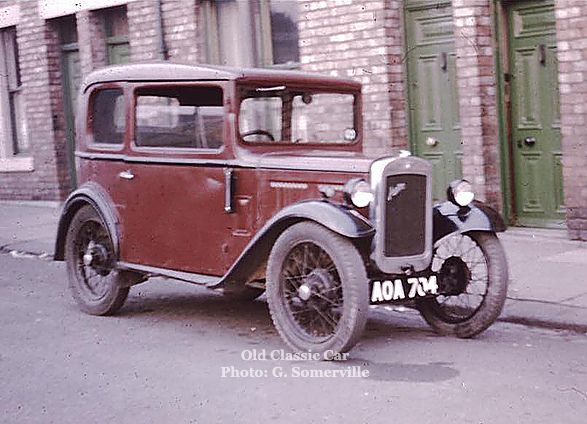 By the time of this (unusually) colour photo of an Austin 7 that still was in regular use, it had seen around 25-30 years of action already (the photo looks to date to the late 1950s-ish). Graham provided this charming old photo, the 7 belonged to his family and was later replaced by a slightly more up-to-date Big 7. 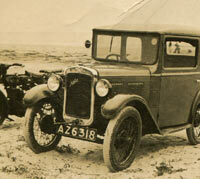 A photo of the two Austins together can now be found on the Austin Big 7 page. The chrome-rad saloon bore the registration AOA 704 which, according to the OA page within the registration look-up section of Old Classic Car, dates it to 1934 and puts it as first being registered in the Birmingham area. 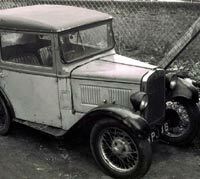 This therefore is a late-ish example of "box" saloon, produced not long before the revised Ruby landed in the showrooms, also in 1934. Thanks for the photo Graham. Return to Page 16 in the photograph gallery.